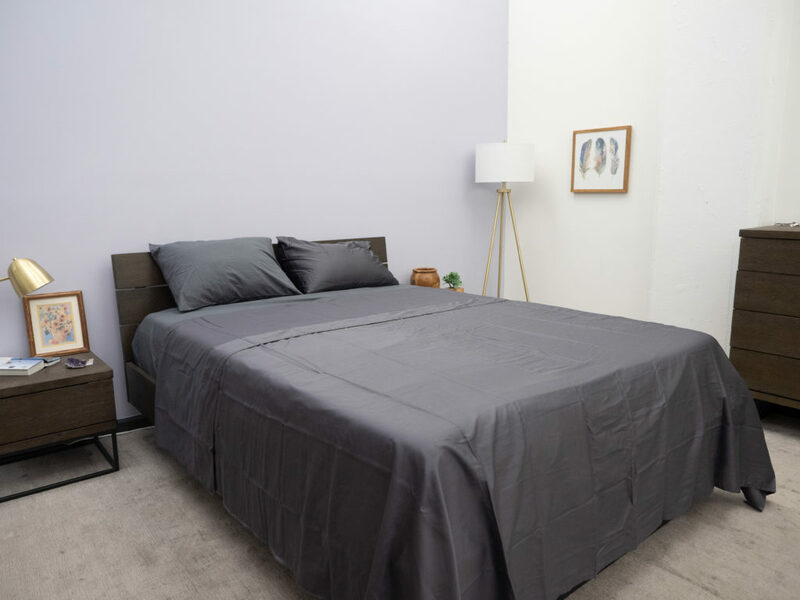 Parachute Sheets Review - Should You Buy Sateen or Percale Bedding? If you’ve ever been flipping through a magazine and came across some pictures of fluffy animals cozily curled up in sumptuous folds of bedding, you were most likely looking at an ad for Parachute sheets. And if you’re like me, you probably felt a little jealous of those sleepy, hibernating creatures. So, Sleepopolis is here to burrow into this bedding and see what it’s really all about. I’m going to test both Parachute’s sateen and percale sheet sets so we can get a good sense of how they feel and which sleepers might be most compatible with which material. If you don’t have time to read the full article you can click this link to jump to the review summary. Egyptian cotton makes these Parachute sheets incredibly soft and cozy! Both Parachute’s sateen woven and percale woven sheets are made from 100% long-staple Egyptian cotton, which has a reputation for being strong, durable, and oh-so-soft. There is no thread count information included with either sheet set, and the folks at Parachute say that thread count is not as important as we’ve been led to believe. Instead, they encourage sleepers to pay attention to the caliber of the fabric itself. While each sheet set is made from the same cotton, they offer different feels and appearances because they are woven differently! Parachute’s sateen woven sheets feature a subtly lustrous sheen, as well as a silky-soft handfeel that is characteristic of this style of weave. Sateen is also naturally wrinkle-resistant which is a nice perk, but it’s worth noting that the luminous sheen of sateen sheets will diminish slightly over time, and with every wash cycle. Percale, on the other hand, offers a more crisp and cool feel as compared to sateen. Like I said, both are made from long-staple Egyptian cotton, but the percale woven sheets are less silky and lustrous and more light, crisp, and breathable. 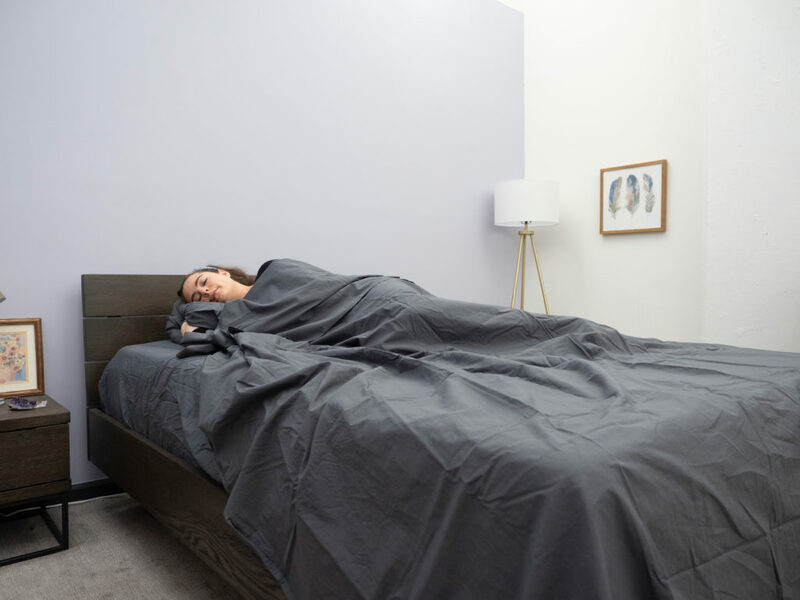 The folks at Parachute say that the classic one-over-one-under weave of the percale sheets creates a handfeel akin to the “perfect white button-down shirt: crisp, clean and livable.” Unlike the sateen woven sheets, though, the percale set is garment washed which serves to bump up the cozy-comfort factor. More: For those a little unsure about what garment washing is, it’s a technology within textile production that’s used to enhance the softness and comfort of the fabric while also giving them a unique style and ‘worn-in’ aesthetic. Egyptian cotton is widely regarded as superior in quality because of its extra-long fibers, and many sleepers use Egyptian cotton sheets year-round. However, percale tends to sleep a little cooler, while sateen tends to be a bit thicker and better at keeping you warm. Parachute’s percale woven sheets feel, as the company puts it, crisp, clean and livable. They have a very soft handfeel but definitely offer more of a cool breathability as compared to the sateen sheets. These sheets are also more light in weight than their sateen counterparts, so they are likely going to do a good job of keeping sleepers cool. Both sheet sets come with two pillowcases and a fitted sheet capable of accomodating mattresses up to 16 inches deep. But something to remember is that Parachute’s bedding sets do not come with a top sheet. The company says that it’s a matter of personal preference, and if sleepers want to add a top sheet to their purchase, they can. But top sheets are not included in Parachute’s bedding sets. Because the nature of percale is so crisp, there is a bit of a crinkly noise when you bunch these sheets up or roll around on top of them. However, because these particular percale sheets are garment washed, they are less starkly crisp than some other percale sheets I’ve tested and a bit more smooth. The garment washing does add a coziness that makes you think that they’ve grown soft and cool after many years of washing. 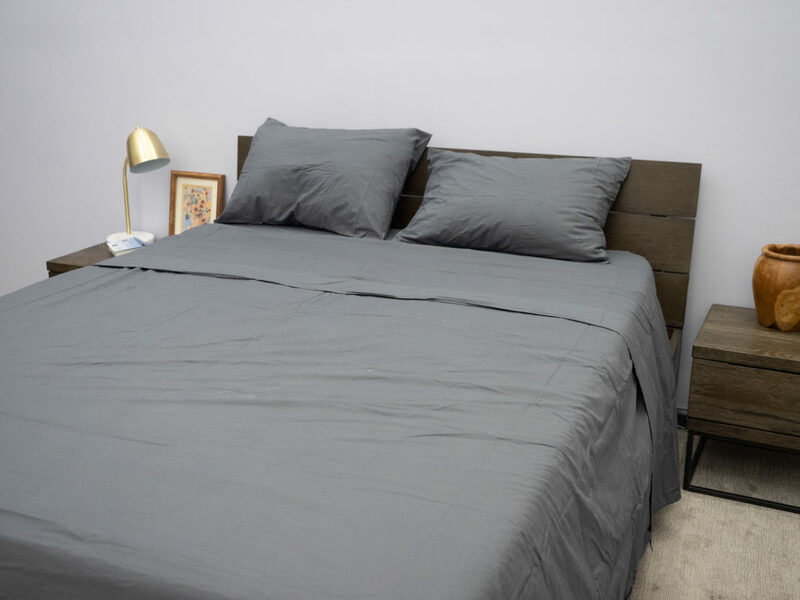 While I’m testing both these sheet sets in the company’s “slate grey” color, the percale sheets are going to be have a bit of a lighter hue than the sateen sheets. This is due to both the nature of the different weaves as well as the garment washed quality of the percale sheets. So, the percale sheets will look light grey while the sateen sheets look dark grey. When you look at the sateen sheets alongside the percale sheets, you can see the difference without even having to feel them. Parachute’s sateen woven sheets have a lustrous sheen, a silky drape, and a billowy quality that sets them apart from percale. And these sheets are as silky-smooth as they look. Compared to the crisp cool handfeel of the percale sheets, the sateen set feels a bit heavier in weight and a little less breathable. However, the sateen sheets feature this luminous sheen and elegant drape that, like I said, is not present in the percale set. So, each style of weave brings its own personality to the table and offers different benefits. As I mentioned, the sateen set also comes with a fitted sheet and two pillowcases. However, it’s worth noting that the pillowcases’ openings are on the back and down the middle of the pillow rather than on the side. For some, this can be a pillowcase perk or a pillowcase dealbreaker. Neither sheet set is particularly noisy, but where the percale makes a bit of a crinkly sound, the sateen makes a bit of a swooshing sound when you rub your hands over the material. Again, it’s not so noisy that it would wake you out of a sound slumber, but when you’re on the hunt for the perfect bedding, it’s important to consider every detail! HOW DID YOU LIKE THEM, SARAH? As I slipped into bed, I honestly gasped at the lustrous, billowy beauty of the sateen top sheet. The slate grey color is gorgeous, and the darker color seemed to enhance the sheen and make the draping a bit more pronounced. It draped over my body in a way that carved out my shape’s silhouette, and it made me feel pretty elegant. Personally, top sheets give me more playful vibes and are fun to fan out overtop of me, and I consider the fitted sheet to be more of a “homebase” accessory. By that I mean that the fitted sheet is never going to slip off the bed; it’s there to comfort you no matter how much rolling around you do. So, I chose the percale fitted sheet because it’s cool, crisp, and breathable and I prefer to have those qualities as my homebase. So, as I rolled around in bed, I had the cool crispness of the percale as my foundation and the silky smoothness of the sateen as my cover. Because I’m a naturally warm sleeper, I often sleep without a comforter and just use a top sheet as a blanket. And because this sateen woven top sheet is a bit heavier in weight (as compared to the percale), I could certainly imagine myself using it as a blanket in the summertime. That being said, sleepers should feel totally encouraged to mix and match fabrics and colors when browsing Parachute’s bedding collection. Of course, if you know you prefer percale to sateen (or vise versa), you’re welcome to order your entire sheet set to be the same fabric. I dressed one of my pillows in sateen and one in percale so that I could bounce back and forth between feels. Speaking of pillowcases — the one thing that was sort of detracting from my sleep experience was the fact that the slit is in the back of the pillowcase, right down the middle of the pillow. I’m a frequent pillow flipper and I also like to embrace my pillow from underneath, with my arms cradling the underside. But I don’t want to rest my face on the opening, and I also don’t want to get my hand caught inside the slit as I try to embrace the pillow from underneath. So, if I had to change one thing about this bedding, it would probably be the placement of the pillowcase opening. Overall, though, I really enjoyed rolling around in this bedding. I liked feeling like I was able to customize my sleep space by mix and matching percale and sateen weaves, and I think they each have some great qualities. So, whether you prefer the sumptuous smoothness of the sateen or the cool crispness of the percale, I think both bring something special to the bedroom. SO, HOW DO I KNOW WHICH SHEET SET IS RIGHT FOR ME? Parachute’s sateen and percale woven sheets have very different personalities, and they each bring something special to the bedroom. So, let’s compare each set side by side so you can get a good look at which one might be best for you. Of course, you’re not limited to one or the other, and Parachute does offer customizable mix-and-matching. So, feel free to get creative! Likes a Crisp Feel — Parachute’s percale sheets have a crisp handfeel comparable to a button-down dress shirt. If you prefer crispness to silkiness, try Parachute’s percale sheets first. 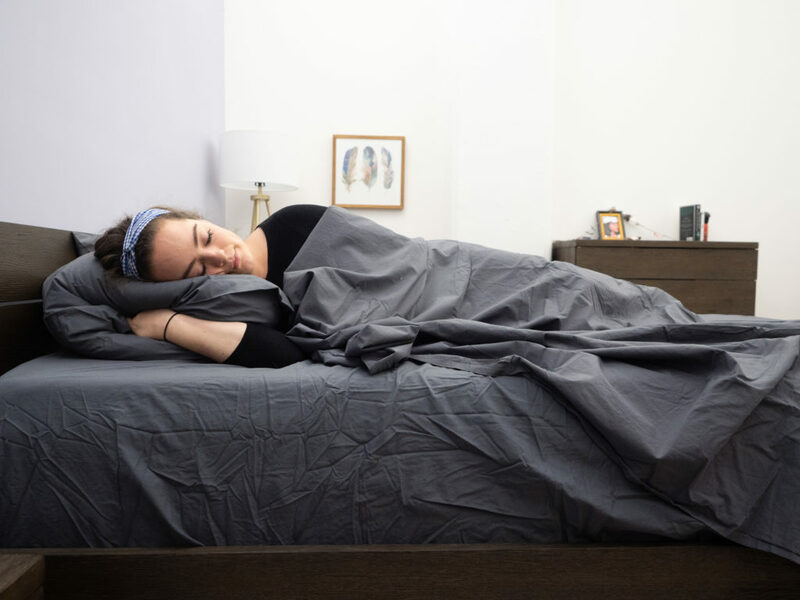 Sleeps Warm — Because these percale sheets are quite cool and breathable, they are better suited for the warmer months, and for folks who run hot. If you’re prone to waking up in sweaty PJ’s, percale might be the best choice for you. 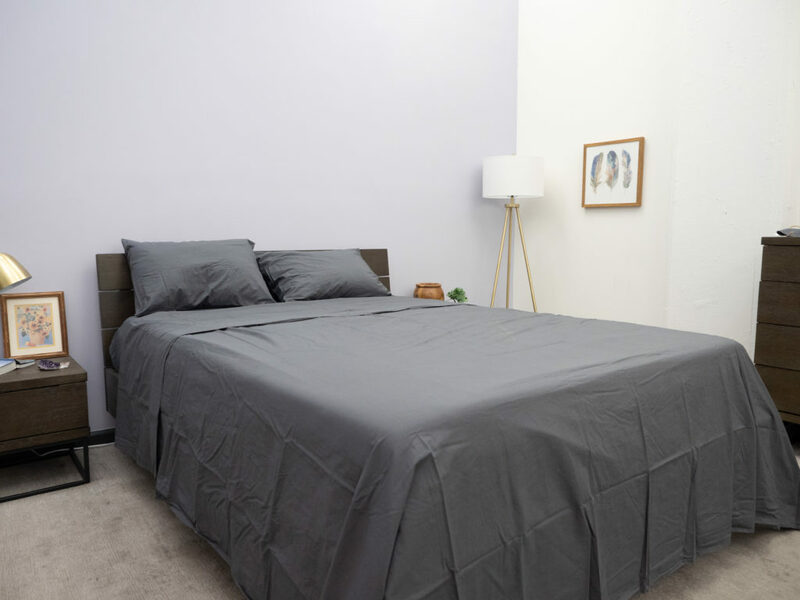 Prefers a Matte Finish — Parachute’s percale sheets (and percale sheets in general) are not shiny. Instead, they offer a more muted, matte finish that, again, mimics the look of a dress shirt. Likes the ‘Sateen Sheen’ — Parachute’s sateen sheets have a lustrous sheen that offers a shiny, glossy appearance similar to satin or silk. Sleeps Cool — These sheets lie heavier on the body as compared to Parachute’s percale sheets, and sleep a bit warmer. They aren’t warming (like flannel, for example) but they are less cool and breathable than the percale set. Prefers a Silky Feel — These sheets don’t just look silky, they feel silky too. 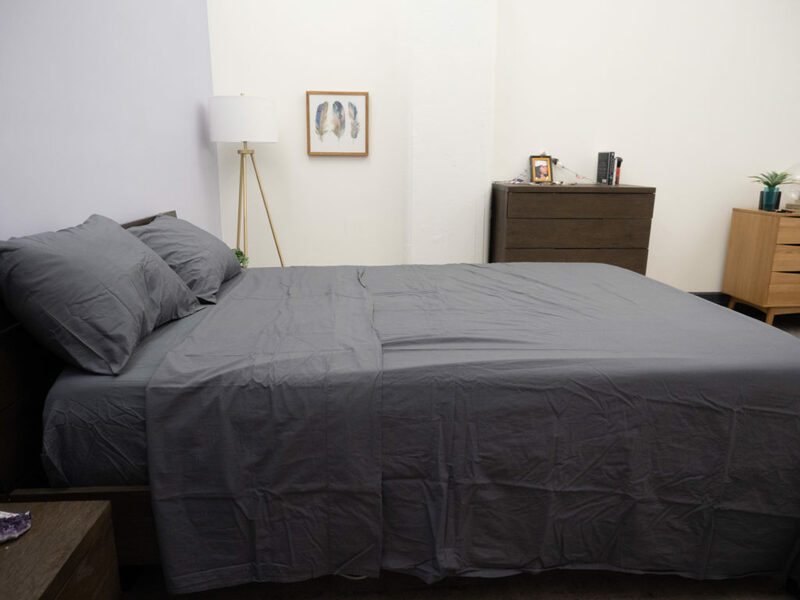 Parachute’s sateen sheets are more creamy-smooth than crisp. SHOULD I TRY PARACHUTE SHEETS? Oh-So-Soft — Whether you prefer the luster of sateen or the crispness of percale, both are made from fine, long-staple Egyptian cotton which is wide regarded as the highest quality cotton. Regardless of the weave, the long, fine cotton fibers makes these sheets strong, durable, and oh-so-soft. Customizable Comfort — Even though a top sheet doesn’t come with these sheet sets, you do have the option to customize your bedding. 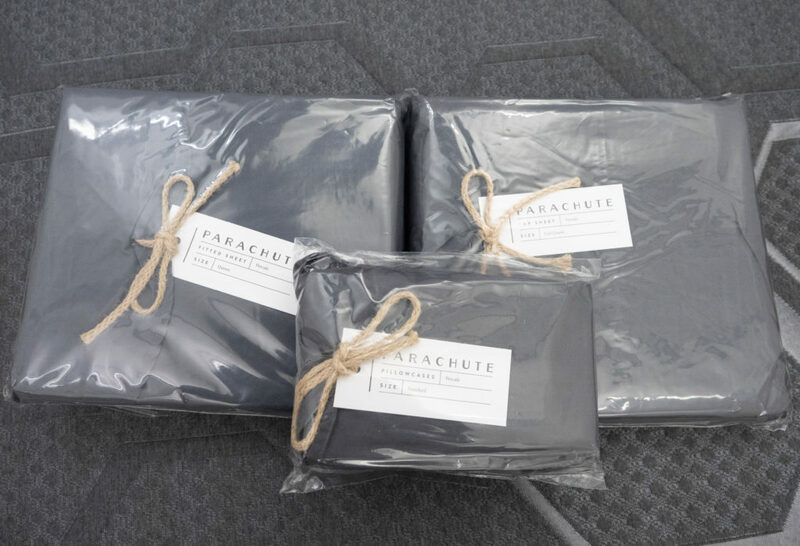 Parachute offers sleepers the option to mix and match fabrics and colors so, if you wanted to, you could order a cotton fitted sheet in grey, a linen top sheet in white, and pillowcases in powder blue. This way, you can really curate your perfect sleep space. Trial Period — Something that always takes the pressure off for me is a trial period. 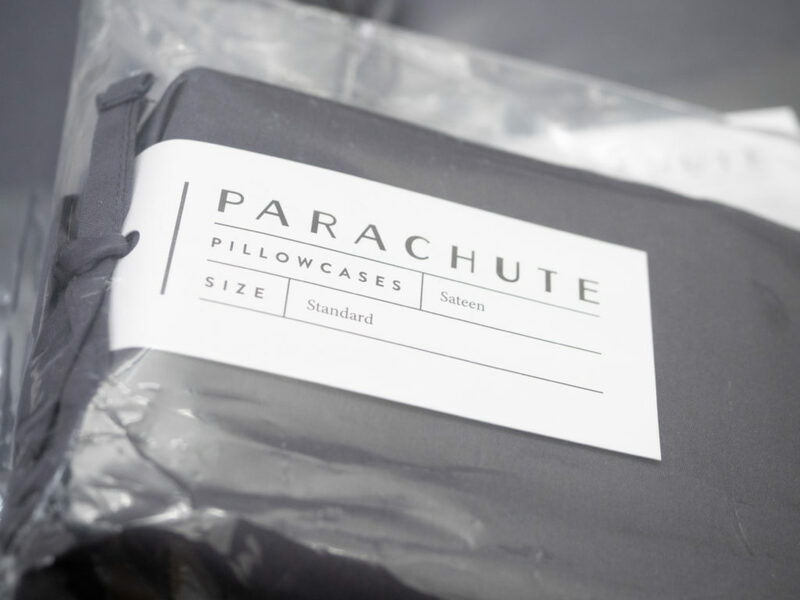 Parachute offers a 60 day trial period wherein sleepers can test this bedding out and see how they like it. And if not, just send it back for a refund, no questions asked. No Top Sheet — While it is kind of a cool perk that you can customize your bedding by mix-and-matching fabric colors, I do wish that the bedding sets included a top sheet. It is a matter of personal preference, and I do prefer a top sheet to come with a sheet set. Of course, you can choose to purchase one separately, but that is an additional purchase. Pillowcase Slit — A bit of a small pet peeve of mine is that the pillowcases open in the back. This kind of limits my ability to flip my pillow because I don’t want to sleep on the side with the opening. I also found that my hand can accidentally slip in and get caught in there when I’m embracing my pillow and, to me, that’s a bit of a drawback. Cool vs Warm — In my experience, the sateen woven sheets kept me warm, and the percale sheets kept me cool. So just remember that when you’re shopping for your sheet sets. If you’re a hot sleeper or shopping for the summer, perhaps percale is your best bet. And if you’re looking for a thicker sheet that’s going to keep you a bit warmer, maybe go with the sateen. Wash Care — Machine wash cool using mild, liquid laundry detergent. Do not bleach. Iron on low heat if desired. Tumble dry low. Made from 100% Egyptian cotton, Parachute sheets are a durable, dependable, soft, and cool. Compared to most other sheet sets I would rank these among the top tier. The stone washed finish gives them a unique soft feel and aesthetically pleasing matte look. Although no top sheet is included, the option to add one is still there. Save a little money and avoid the hassle of a tangled ball of sheets. To cap it off, the Parachute sheets are a well made set and a good option for sleepers who enjoy cool cotton sheets.